The Studded Leather Dog Collars are made from premium bridle leather, not synthetic or reconstituted leather that's comfortable to wear and has a consistent grain and thickness. For extra strength and durability both the tartan and studded collars, displayed below have heavy gauge buckles and D-rings and available in a choice of traditional colours. The studded dog collars, have a full leather lining, with nickel plated studs which makes the collars highly decorative and very strong. Leather is a natural material which has a number of benefits, it looks wonderful, is strong and water repellant so it's been used as a traditional material to create a variety of dog collars in various designs and colours for many years. 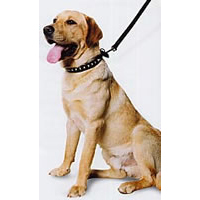 However if your dog is guilty of constantly chewing or enjoys swimming, it is advisable to purchase a synthetic fibre such as nylon for both your collar and lead, which are also available on this website. There are many leather collars and leads on the market, but not all of them are made to the same high quality and will crack or split when folded only after a little use and need to replaced after a short period of time. But the natural oils in a high quality studded, patterned or tartan leather dog collar will help prevent damage and act as water barrier increasing the longevity of your collar or lead so that you only need to replace it after many years of use. Why not compliment your new studded or tartan leather dog collar with a matching leather lead, to complete your dog's look? We stock a large range of Leather Dog Collars and Leads suitable for all breeds, just look at the other pages on this website Leather Dog Collars, Leather Check Chain Dog Collars, Leather and Chain Dog Collars, Round Leather Dog Collars,Leather and Chain Dog Leads , Greyhound and Whippet Collars. 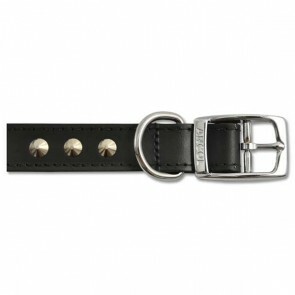 Studded & Patterned Leather Collars: 5 stars out of 5 based on 0 user reviews.